I made a binary clock with ATtiny85. ATtiny85/45 has 5 pins for input and output. I used 4 for driving two shift registers and was left with just one for input. You have to set the clock somehow, you know, and that is much more convenient with two buttons rather than one. So I arranged two resistors and two buttons so that pushing one of them gives 5V and the other 2,5V. After I had finished this library I found out, that I can't use millis() and this exact library while ATtiny85's timer0 is in use for interrupts that keep the time... Then I did a modification that instead of comparing millis() increase I count some number of loops that read same button value. You can see that version in my binary clock code. This idea can be extended to more than two buttons also. I've illustrated possible schematics below. 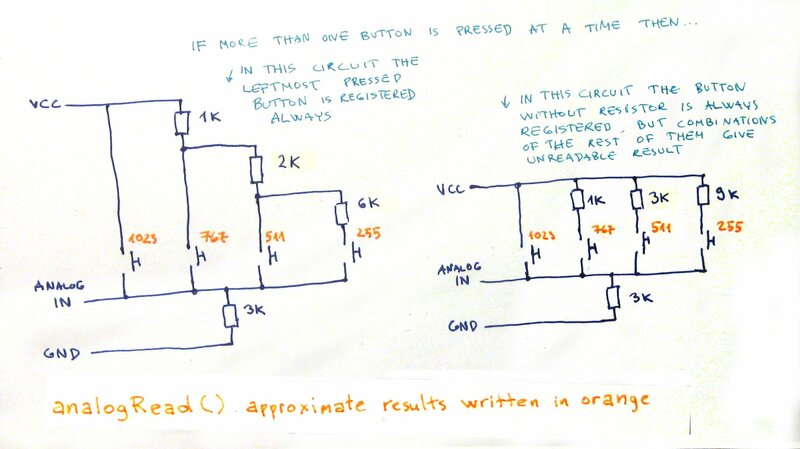 Note that for getting evenly distributed analogRead values you have to use resistors of different values.